You know what all of the recent cupcake backlash made me want to do? Eat a cupcake, that's what. 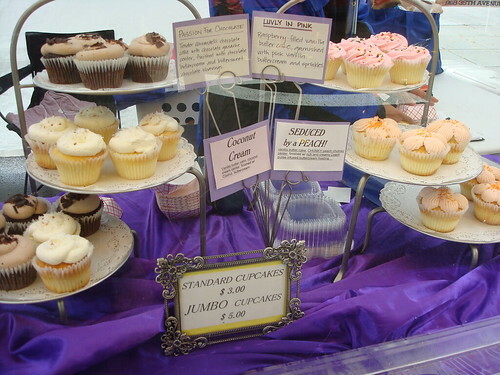 So I was particularly excited when I happened to discover a new-ish custom cupcake business based in Kirland, WA called Cupcake Luv, which had a booth at the Mercer Island Farmer's Market. They had a gorgeous array of beautifully decorated cupcakes. They were a bit spendy ($3 for a "regular"; $5 for a "jumbo") but most variations were filled and all of them were beautifully decorated, so it took away a bit of the sting. 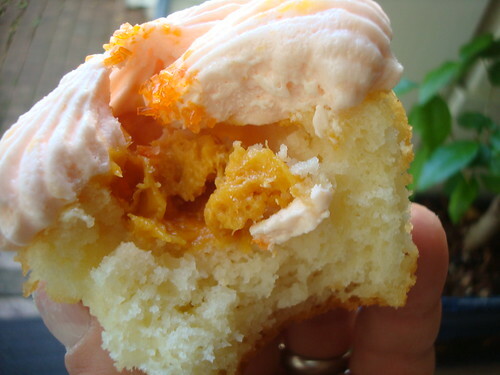 I picked up the "Seduced by a Peach" (vanilla butter cake filled with a chunky peach chutney, and finished with buttercream with peach puree); while generally I shy away from fruit flavors (too healthy! ), it seemed really fresh and seasonal, and was a flavor I hadn't seen anywhere else. 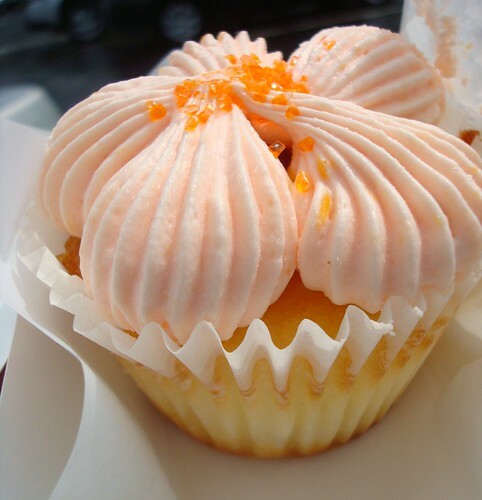 The cupcake itself, which was a vanilla cake filled with fresh peach preserves and topped with a peach buttercream, was satisfyingly heavy--a good start. The cake itself was moist and finely crumbed, and nicely complemented by the sweet, creamy frosting. Unfortunately, it was the beautiful decorating that was its ultimate fatal flaw: since the piped frosting was applied directly above the filled part of the cake, it didn't have much to hold on to, and so when the cupcake was bitten into, the frosting tended to flake off and a precious morsel even fell to the ground (just picture it in slow motion: noooooo!). Construction aside though, it was a pretty delicious cupcake. Just make sure to eat carefully, perhaps even with knife and fork. Want to feel the Luv? 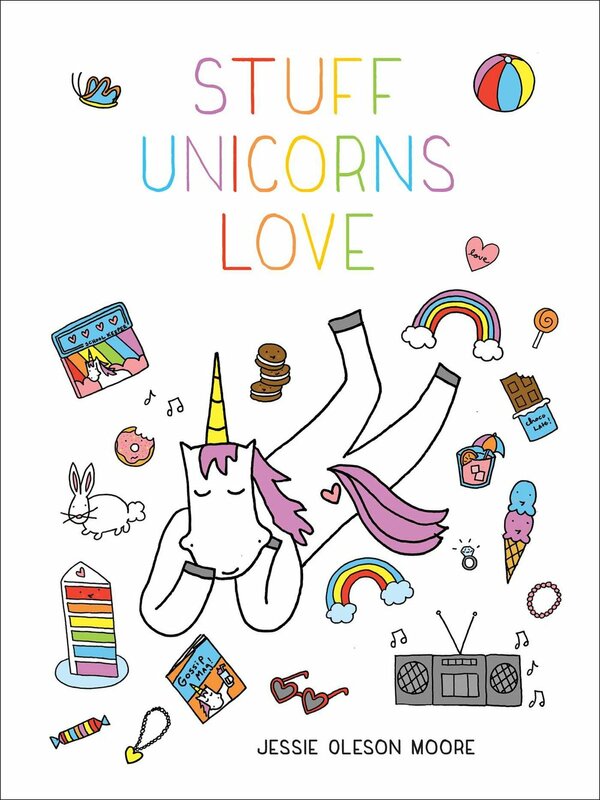 Check out Cupcake Luv's website here; they can also be found at Kirkland's Wednesday and Friday Farmer's Markets; Issaquah and Woodinville's Saturday Farmer's Markets, and Mercer Island's Sunday Farmer's Market. For more information on the Farmer's Markets including locations, visit pugetsoundfresh.com.